Brown Sugar Cookies. No Fuss. I made these this weekend: http://www.101cookbooks.com/archives/brown-sugar-sandwich-cookies-recipe.html but as I have next to no trends towards neatness and care, I made them my own more sloppy way. 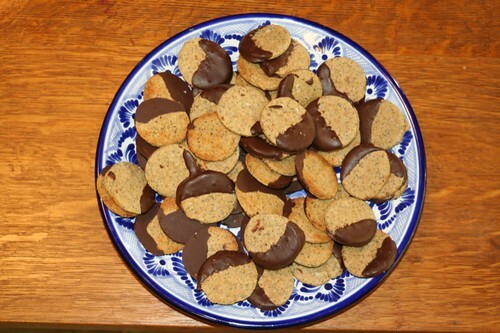 Instead of building sandwiches, I just dipped the toe of each small cookie in melted chocolate. I also had no whole wheat flour, so I used a combination of general purpose unbleached flour, and rye flour. Pretty low on the guilt scale too! This entry was posted on January 10, 2009 at 10:52 pm and is filed under Food. You can follow any responses to this entry through the RSS 2.0 feed. You can leave a response, or trackback from your own site.